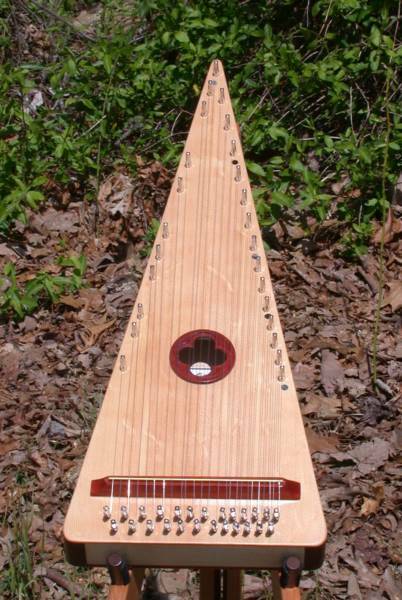 These dulcimers are not constructed from forms, and no two are alike. Each is made from materials carefuly chosen for color, grain, and texture, and I let the wood itself determine the final shape of each instrument. They are finished with hand rubbed shellac for a smooth, siliky finish that will last a lifetime. In short, these are the finest instruments I have made, each sure to be a treasure that is as much a joy to hold as it is to play. Beautiful dark poplar body with a cedar sound board, this dulcimer also features hand carved Celtic spirals on the headstock. The fretboard is walnut with maple accents, including abalone fret marker dots. The sound holes were cut using an actual poplar leaf from a tree in my yard as a pattern. 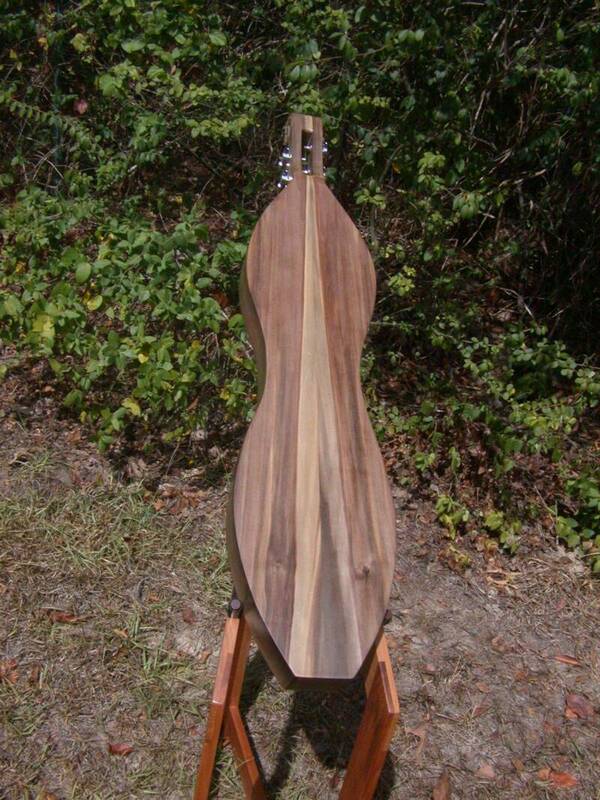 Light poplar body with a dark streak on the book matched back, this dulcimer has a top made of redwood. 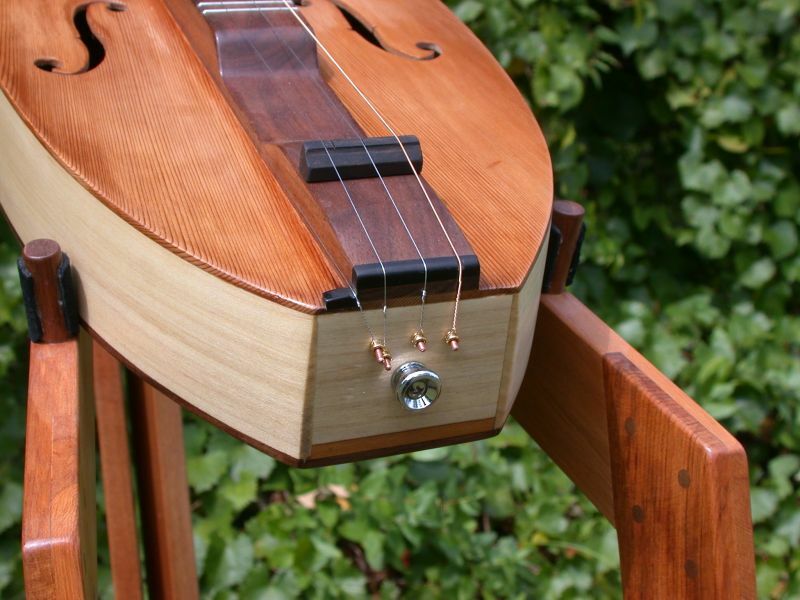 The nut, bridge, and fret marker dots are made from 100 year old piano keys, and this dulcimer comes with two strap buttons. 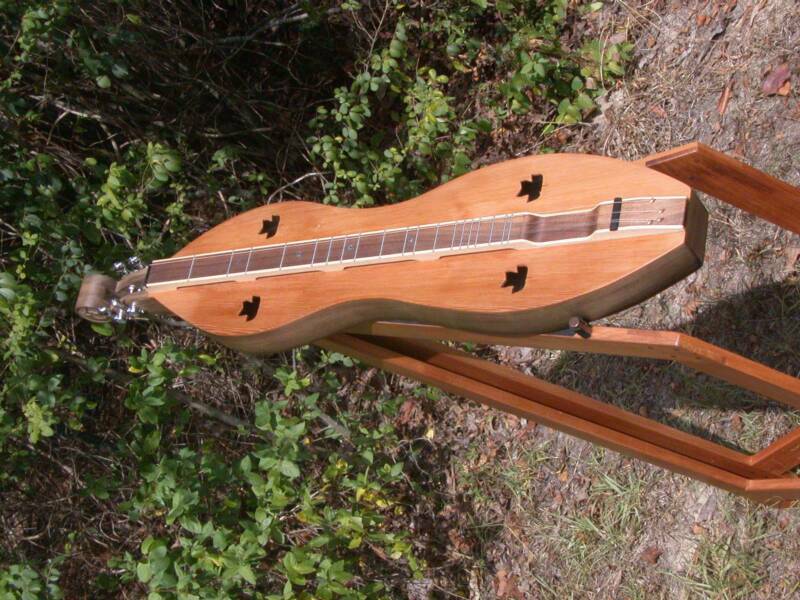 This dulcimer is loaded with features. The body is poplar, with a cedar top and walnut fretboard. The fret marker dots, nut, and bridge are all made from 100 year old piano keys. The back is bound with walnut, and two strap buttons are included. In addition, this instrument has an ebony insert on the end of the fretboard for string crossover, and another inlaid into the top, This piece, coupled with the walnut dowel on the side of the fretboard, allows one string to be held out of the way for three-string play. A truly exceptional instrument.